The NFL playoffs are generally the only time of the year I watch professional football. I am primarily a soccer fan, and I generally don't have three or four hours to spend in front of a television set. I follow the game a little, but when I watch sporting events, I want bang for my buck: Ninety minutes of uninterrupted soccer -- early in the day, thanks to time difference, once every week or so does me fine. That said, I was at my in-laws yesterday and saw most of the NFC Championship game (which was close, and marred by a crucial officiating error) and part of the AFC Championship. With my Saints out of the Super Bowl, I checked the news this morning to see whether the Patriots won. When I did, I found the following at the tail end of an ESPN piece with the following promising title: "Patriots' Super Bowl LIII Trip Is a Bill Belichick Masterpiece for the Ages." This nonsensically follows what what had contained the elements of a good buildup. You can learn that football mastermind Bill Belichick and the Patriots faced long odds from the start of the season and overcame them; they had a definite, well-executed game plan; and they managed to built up an early two-touchdown cushion. Tom Brady and company needed every single point of that cushion just to get the opportunity to try for that game winning touchdown. Besides, think what you will of sudden death rules, there's no guarantee that, had the Chiefs won the toss, they would have scored, as spectacular an offense as they have. What was more important than the coin toss or even what happened afterward was what it took to get to that point. That the Brady touchdown might have seemed routine, or a foregone conclusion, does not detract. It underscores that point. Ironically, when I read this story, whatever algorithm ESPN uses to queue stories after each other came close to doing for the sports writer what he says the coin did for the Patriots. That title? "Tom Brady Exults, Says 'Odds Were Stacked Against' Patriots." Congratulations to the Patriots on their continuing success. P.S. Curiosity and a desire to learn from Bill Belichick led me to a somewhat rambling article about Burj Najarian, mentioned early on in the above-mentioned story. This led me to a transcript of (or notes from) a show about Belichick's right hand man. From those notes, one can learn just how comprehensive and integrated Belichick's coaching is. (He trains players to answer questions in a way that won't give opponents information they can use, for example.) One can also see that Najarian vitally performs many necessary tasks for Belichick, allowing him to concentrate on football matters. (This is in addition to Belichick avoiding social media and being the only coach to refuse to join the NFL Coaches Association.) 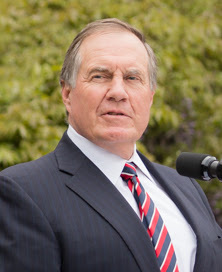 Belichick is routinely and unjustly called names and belittled for seeking every small advantage, but one can learn a lot from someone who has a lifetime winning record in the Super Bowl and is heading to another.